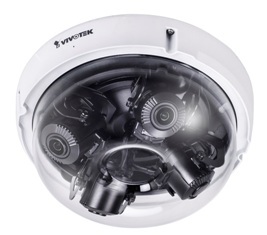 New Delhi, 6 December 2017: – VIVOTEK, the global leading IP surveillance solution provider, today announces the launch of its multi-adjustable sensor dome camera, the MA8391-ETV. Featuring four independent 3-megapixel CMOS sensors, the MA8391-ETV allows users to simultaneously view four different areas while occupying only a single IP address. This not only reduces the installation time and total number of cameras needed, but also reduces management effort and maintenance costs. Due to its unique and small design, the camera is perfect for surveillance of large areas, such as parking lots and shopping malls, as well as for spaces like hallways intersections and building corners. Building on its strategy of “See More in Smarter Ways”, VIVOTEK is proud to roll out the brand new MA8391-ETV. Especially equipped with four independent sensors, each sensor features 3-megapixel and a 2.8 to 8 millimeters lens with remote-focus capability, allowing clients to both monitor wide spaces and retain a clear view of all details with the zoom-in function. This versatility makes operators are able to remotely tune the zoom and focus of each individual lens precisely, enabling full 360° coverage. Furthermore, it deploys SNV (Supreme Night Visibility) technology and a removable IR-cut filter, making it a true professional day and night camera.